We started on the shop layout this week, the board is only 26" wide, for some reason I decided to make the area even smaller by having two end to end layouts, on in N and one in OO. They both have to be very basic, the plan is to use automatic shuttle units on both sides and have locos moving quite slowly, we will also use the tracks to test any second hand stock we sell. So far we have managed to get the cork and track laid on the N gauge side. What a great idea. You can then 'post' videos of the second-hand stock running for prospective buyers. First I have to learn how to make and upload videos! First, I have to learn how to make and upload videos! You can use a smartphone and then upload it via, for example, Photobucket. If an old git technophobe like me can manage it, I am sure that you can! An excellent idea. I would think it is a lot easier to sell an engine if the prospective purchaser can see it running, rather than looking at a box. My problem is I think I have a face for radio and a voice for silent movies if you get what I mean ! Despite the shop being quite busy today I manage to lay the cork and fix down the track on the OO side. I know our Sticky Stuff+ is good, I just didn't realise how good it is, 2 hrs was all it took to cure. Just need to lay a few droppers, not sure if we need those actually, but better to be safe than sorry. I am so glad that you are doing this Graham. I love the idea of a seller of secondhand stock being able to show locos in action. Wishing you all the best with this business! Thanks for that, we think it is near unique in the model railway shop world. We also plan to show how the model is built up by leaving parts unfinished to show the whole build process. Sorry to disappoint you Graham but my local shop had something similar a few years ago. He has enlarged the shop now and has upgraded to full circular tracks. 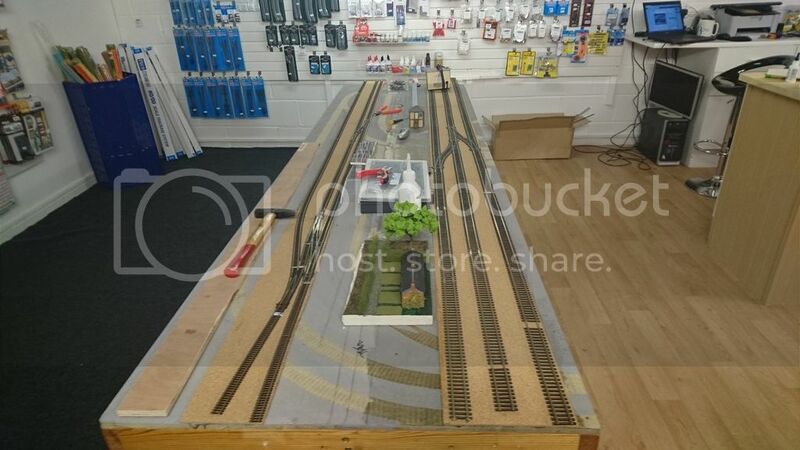 He has a large 00 gauge and a smaller n-gauge layout both with a bit of scenery too in the back room of the shop. It has to be a good idea to be able to show customers a any loco running so well done. don't forget to add the buffer stops to the launch pads!
. better idea. have dead track beyond the buffers as a safety net.